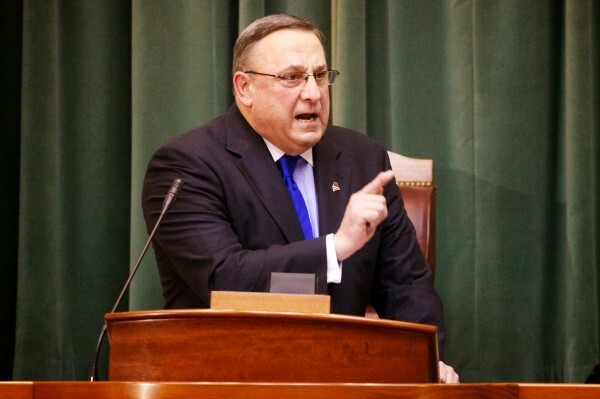 AUGUSTA, Maine — In his State of the State address, Gov. Paul LePage committed to “fast track” permitting for the state’s natural gas delivery infrastructure in the same way his predecessor, Gov. John Baldacci, did for wind power projects. The Republican governor’s proposal was more than just a jab at his Democratic predecessor and potential gubernatorial campaign rival in 2014. It derives from LePage’s commitment to position Maine businesses to participate in what Patrick Woodcock, director of the governor’s energy office, described as a transformational rebirth of U.S. manufacturing fueled by low-cost natural gas. At present, residential and business access to natural gas as a heating or energy source in Maine is limited. Three companies — Unitil, Bangor Gas Co., and Maine Natural Gas — deliver natural gas via pipelines to approximately 33,000 customers, primarily concentrated in some of the state’s more heavily populated areas. Efforts to expand access to natural gas in Maine continue on multiple fronts. Two firms, Summit Natural Gas of Maine and Maine Natural Gas, are competing to lay a natural gas delivery pipeline in the Kennebec Valley. The Dead River Co. and a Boston firm recently began trucking compressed natural gas to commercial customers who are not served by a pipeline. Major energy consumers, including hospitals and paper mills, have converted to natural gas as their primary energy source. LePage wants to support and broaden those efforts, and Woodcock offered a general strategy Thursday for how the administration hopes to do so. Specifics will be announced soon, he said. One element of the fast-track framework, modeled after the 2009 Maine Wind Energy Act, would establish in state law numeric goals for installed natural gas capacity. If incremental benchmarks for the expansion of natural gas capacity become part of state law, companies seeking environmental permits, Maine Department of Transportation and local approval could benefit by showing how their projects would push the state closer to meeting goals established in state law, as is the case now with wind energy, Woodcock said. In turn, a faster permitting process would minimize the negative competitive effect of Maine’s short construction season. U.S. Energy Information Administration data show that about 5 percent of Maine homes (21,000) now heat with natural gas, compared with almost 70 percent heated with oil. A Maine Governor’s Energy Office online tool to compare the cost of heating an average Maine home with different sources indicates that heating with natural gas is roughly $1,000 cheaper annually than oil, based on current prices. A second component would tap the Finance Authority of Maine as a potential loan guarantor to help private companies secure financing for natural gas pipeline projects in rural areas. A third part of the fast-track strategy involves exploring conversion of heating systems at state facilities to natural gas. That would lower energy costs paid by taxpayers and allow state facilities to function as higher consumption anchors that make expansion of natural gas lines economically feasible, Woodcock said. In Augusta and Gardiner, that effort is stalled by legal wrangling between Summit and Maine Natural Gas. Thomas Kiley, executive director of the Northeast Gas Association, and Jared desRosiers, a partner in Pierce Atwood’s energy practice, both cited the need for Maine to recruit “anchors” — high-energy consumers — to make it financially worthwhile for natural gas companies to extend pipelines into rural areas of Maine, where residents could then capitalize on lower-cost energy. With properties throughout Maine, state government could take on the role of anchor if other options don’t emerge, Woodcock said. A fourth part of LePage’s natural gas expansion strategy centers on reducing consumers’ cost of converting to more efficient heating systems. The initial cost of installing new, more cost-effective equipment often runs into the thousands of dollars, posing a financial barrier to most Mainers. To overcome that hurdle, the administration proposes using additional money the state expects to receive as a result of proposed changes in the Regional Greenhouse Gas Incentive program to offer what Woodcock calls a “technology-neutral” rebate program to businesses and homeowners that install equipment that reduces their annual energy costs. Natural gas would be one option, but industry and families could use the rebate for other technologies, such as geothermal heat pumps, that reduce annual energy costs. Woodcock said making the rebate program “technology neutral” would keep state government out of the business of picking “energy winners and losers,” a practice at which the government has “been abysmal for 30 years,” according to Jamie Py, executive director of the Maine Energy Marketers Association. LePage’s focus on maximizing the economic benefits of natural gas as an energy source aligns with projected long-term global trends. Based on its analysis of production and market factors, the U.S. Energy Information Administration forecasts that natural gas prices will compare favorably with oil and other energy sources through 2040. That forecast reflects the dramatic increase in domestic natural gas extraction from the Marcellus Shale formation in the Appalachian Basin and assumes that existing rules and standards will remain in place, according to Angelina Larose, the EIA’s natural gas markets team leader. Increased demand for natural gas to heat homes and generate electricity in the Northeast this winter also caused spikes in natural gas prices in the Northeast, where they are already higher than other regions, according to an analysis released Tuesday by the EIA. Addressing that demand, which analysts expect to heighten as more homes and electricity power plants convert to natural gas, will require new pipelines that deliver natural gas from the south as far north as Maine. LePage administration officials are discussing with other New England governors and Canadian provincial leaders ways to facilitate that type of construction, Woodcock said. At present, the major pipelines that deliver natural gas to Maine flow south from the Maritime provinces, and a decrease in production at the Sable Offshore Energy Project off the coast of New Brunswick elevates the importance of improving delivery from the south. That’s fine with Py, whose organization represents home heating oil dealers, as long as state government doesn’t put its thumb on the competitive scale. “If you’re going to build a pipeline, we won’t stand in the way, but don’t have the public pay for it,” he said. Woodcock asserts that business and consumers, not state government, are driving the focus on natural gas. “When businesses are racing to make natural gas their primary energy source, and they see a lot of opportunity, we try to make sure that state law reflects what businesses are looking for,” Woodcock said. Py noted that heating oil prices compared favorably with natural gas during the past 30 years, a market factor that explains why so many Mainers heat with oil. However, Larose said past trends factor minimally in projecting future energy markets, and Woodcock argued that changes in domestic natural gas production during the past five years have been so dramatic they have redefined the energy marketplace. The EIA’s model also accounts for predictions that the price of natural gas will rise if the U.S. begins exporting liquefied natural gas, a scenario the U.S. Senate Committee on Energy and Natural Resources explored during a hearing Tuesday. The high cost of building facilities to liquefy natural gas for export and other factors led the EIA to forecast that, at most, 3 percent of the natural gas produced in the U.S. would be exported, an amount that would not strain the domestic market enough to spike prices in this country, Larose said. One factor that long-term projections can’t account for is a concern that potentially harmful environmental impacts of the hydraulic fracturing — “fracking” — technique used to extract natural gas from shale would cause state or federal governments to halt the process, thereby reducing the supply or raising the price of shale gas.